Iconic Queen hits include We are the Champions, Killer Queen, Bohemian Rhapsody, Radio GaGa, Under Pressure, Another One Bites the Dust, We Will Rock You... and the list goes on and on! With the film Bohemian Rhapsody being released in October, 2018 is the year to celebrate rock legends Queen, their incredible music and their extraordinary lead singer Freddie Mercury, who defied stereotypes to become one of the most iconic and best loved entertainers on the planet. How much fun do you have on stage? Lots of fun and you have to when you perform so regularly! All the band love performing live, and we enjoy it more than we ever have. I think people often forget that I am also a massive Queen fan and I still watch their concerts, and listen to them all the time. I could never get bored of their music! What’s your favourite Queen song? Somebody to Love has a gospel feel that I love and we get the audience to join in. 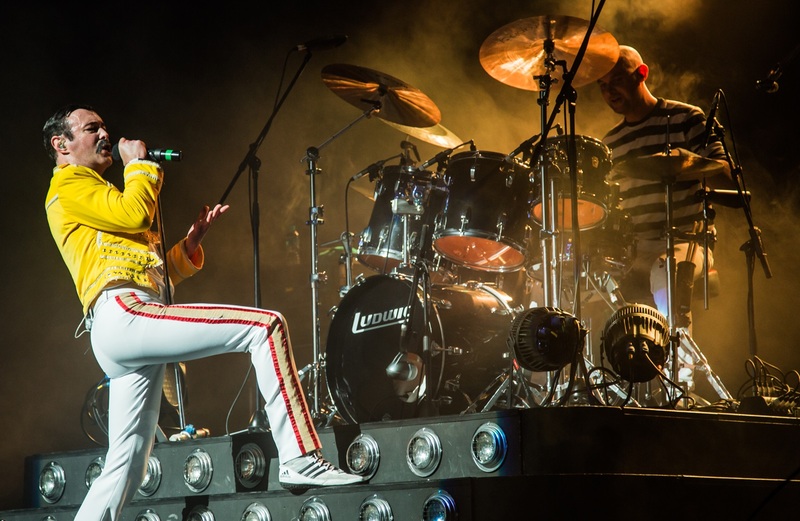 We always encourage the audience to join in and the songs that get the best reaction are I Want to Break Free, as I think people love the video, and Don’t Stop Me Now, which is regularly voted as the happiest song. Funnily enough, Fat Bottomed Girls also gets a great reaction and no-where else would you get women saying to us so proudly to look at their big bums, which they do say to us a lot! How many Queen songs do you perform in the show? About 30. We have to get through as many as we can because of the incredible back catalogue they have, and the list of Queen songs is endless. We include some medleys so that we can feature as many favourites as we can. Freddie held the audience in the palm of his hand. What do you think his secret was? It was his ability to connect to an audience, and even someone standing right at the back of a stadium, and making them feel like he was singing to them. How did it feel meeting Brian May? Meeting rock royalty. He was so nice and humble and modest, and just a really nice guy. It was a dream come true to meet one of my heroes. For the first time in my life I was left speechless! What can guests expect from your Potters performance? It’s the last date of our tour, so we are going to give it everything. We are going to give everyone a rock concert they won’t forget, celebrating the music of Queen. It’s also going to be a big end of year Christmas party for us too and we can’t wait to come back to Potters. Are you going to see the Bohemian Rhapsody film? Yes I can’t wait, especially as Queen have been involved, so there is so much attention to detail. A new generation will also fall in love with Queen music and I’ll be at the front of the queue to see it! *Drinks Inclusive from 6pm until close of bars.